“Easy to use thermometer reads from -58 to 572 degrees." This two-in-one thermometer measures internal temperatures with its probe, and it also measures surface temperatures using infrared. The probe measures temperatures up to 626 degrees, so you can use it for checking your roast, monitoring hot sugar for candy, or checking your frying oil. The probe is five inches long, so you can reach deep into a roast, and it folds for safe storage. The infrared can measure -67 to 482 degrees Fahrenheit, so you can use it for checking the surface temperature of a hot pan or checking food temperature in the freezer. It works well on dark surfaces, but can have trouble with light-colored shiny surfaces because of the reflectivity. This has an auto shutoff and runs on two AAA batteries. It is splashproof but not waterproof, so it shouldn’t be submerged in water. 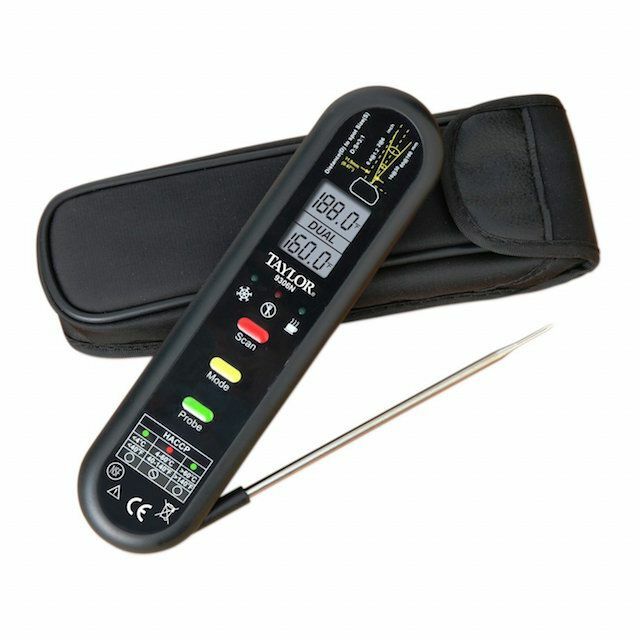 If you do a lot of grilling at night or your oven light is dim, this thermometer speaks the temperature, so you don’t need to bring a flashlight or squint at the numbers. It also has an LED night feature to help you see the numbers, if that’s your preference. It takes about four seconds to get an accurate temperature, and the thermometer has an auto-shutoff feature so you won’t drain the battery. This can read from -58 degrees Fahrenheit to 572 degrees Fahrenheit. You know it’s annoying to stand over a hot oven or grill to read a thermometer, right? Wouldn’t it be nice to be able to check the temperature from across the room? You can do that with this wireless meat thermometer. It has a 300 foot range, so you can’t wander to the neighbor’s house, but it’s far enough to keep you away from the heat. The transmitter and receiver are synched when they arrive, so there’s no setup or pairing required. Just put in the included batteries, and the thermometer is ready to use. It reads temperature from 32 to 572 degrees with an accuracy of +/- 1.5 degrees, and has a backlit screen for easy reading. The screen also changes color based on the temperature. The probe is 6 1/2 inches long to reach into the center of a large roast and has a step-down tip for quick temperature checks, if you don’t want to leave the probe in place. The thermometer has preset temperatures for different types of meat, poultry, and fish, so you don’t need to look them up if you don’t remember. You can also reset the temperatures, to suit your personal preference. It also has a timer function. The failing point for thermometers like this is usually the probe, but this company has you covered since they will replace the probe for free if it fails. If you prefer analog over digital, this dial-style instant read meat thermometer can read from 0 degrees Fahrenheit to 220 degrees Fahrenheit. The shaded surface on the stem indicates the proper depth the probe should be inserted in the meat, and the probe cover lists proper cooking temperatures for different types of meat. While this is much quicker than older thermometers, it’s not quite as fast as digital models — it can take up to seven seconds for the hand to stop moving on the dial. This should not be left in the oven during cooking. It has a silicone ring around the dial for a firm grip for inserting and removing the thermometer. Because this doesn’t require batteries for operation and it’s not expensive, this is a good thermometer to keep on hand as a backup. This thermometer-timer combo is designed for monitoring foods in your oven. While it’s meant to be left in the food rather than inserted for a quick read, you can check the temperature at a glance from the external unit that shows time, set temperature, and current temperature. Like other thermometers of this type, the probes tend to go bad after time, from being kinked or bent, or from excessive heat. It’s a good idea to have extra probes on hand. It reads from 32 degrees Fahrenheit to 392 degrees Fahrenheit. For times when surface temperature is more important that internal temperature, an infrared surface thermometer is exactly what you need. It can measure the temperature of your grill grates, pizza stone, cast iron frying pan, oven walls, or check the exterior temperature of your grill to see if it’s safe to touch without mitts. You can also to use it to check the interior of your refrigerator or freezer, or make sure that your chilled foods are still cold. A visible laser light lets you target the point you want to check, and an LCD readout with a backlight makes it easy to read the results. This thermometer can read from -58 degrees Fahrenheit to 716 degrees Fahrenheit. This slim thermometer has many features as larger models but is not much bigger than a pen. It can measure temperatures from -58F to 572F with an accuracy of .9F between 32 and 212F, and display temperatures in C or F. To save battery life, it switches off automatically after 10 minutes. There are just two buttons on the back of the thermometer to control it. One turns the thermometer on and off, and the other switches between C and F. A split ring on the handle lets you hang the thermometer on a hook, and the included sheath protects the probe in storage. The handle is plastic with a stainless steel finish. The battery is included. While most people use cooking thermometers for meat, thermometers are also quite handy for baking. Rather than relying on thumping a loaf of bread to decide if it sounds done, checking the internal temperature is a more reliable way to determine exactly when the loaf is done. But that’s not all. From measuring the temperature of the water used for proofing yeast, to checking the doneness of a batch of muffins, to testing your home made yogurt, you’ll reach for this thermometer often. It has an extra-long probe, so you can get right to the center of a large loaf of bread and it displays the correct temperature in just four to six seconds. It can read temperatures from -58 to 572 degrees, so you can use it for all of your cooking. This thermometer an on/off switch that makes it simple to operate, but if you leave it on after using it, the auto-shutoff will save the battery life by switching it off after 10 minutes. A sheath is included to protect the probe in storage, so it will be safe in your gadget drawer. Serious grillers know that there are plenty of reasons to be grilling after dark, and this thermometer makes it a little easier with a backlight that makes the thermometer easy to read in any light. Simple to use, the thermometer turns on as soon as you unfold the probe, so you don’t need to fumble for a switch, and it turns off when you fold the probe down again. The ability to hold the displayed temperature means you won’t have to lean over a hot grill to see it, while you can also set the thermometer to display either the minimum or maximum temperature that you’ve read. The body of the probe is waterproof, so you don’t need to worry about steam, splashing, or cooking in the rain. A handy cooking guide on the thermometer reminds you of the proper cooking temperatures for most meats, so you won’t have to remember the exact temperature of rare or medium well. This reads from -58 to 572 degrees, so you can use it for all of your cooking. Smoking is all about long, low, and slow cooking, so it’s best not to open the smoker during cooking, since that lets out flavorful smoke along with the heat that will take some time to recover. This thermometer lets you constantly monitor the meat temperature from outside of the grill, so you can keep an eye on it without disturbing the cooking process. The probe’s wire is designed to withstand temperatures from 32 to 482 degrees, so it won’t be damaged from the smoker’s heat. The thermometer has a color touchscreen display that’s easy to read in any light, it offers presets for a variety of foods, and it has the option to set your own preferred temperature. It can stand on its own on a table, and it also has a magnetic back so you can attach it to your smoker, grill, or oven. An alarm announces when the set temperature is reached,, and you can also set a timer to remind you when to baste or turn the food. A spare probe is included with this thermometer, so you’ll always have an extra on hand. While you can’t plug in both probes at once, users have found that they can use both probes by leaving them in the meat and disconnecting and reconnecting them from the thermometer to read the temperatures one at a time. We bought and tested a top-rated instant read thermometer. Our reviewers spent four hours using the thermometer while cooking chicken, roast beef, and fish. We asked our testers to consider the most important features when using this thermometer, from ease of use to temperature range. We’ve outlined the key takeaways here so that you, too, know what to look for when shopping. Leave-in or leave-out? Some thermometers are meant to be left in the food during cooking. They’re convenient for roasts or poultry, but would not be as useful for quickly checking a steak. Other thermometers are meant to be inserted into the food just long enough to read the temperature. They’re great for steaks, but you can’t constantly monitor a roast as it cooks. Temperature range There’s a relatively small range of temperatures you’ll need for cooking meats, but if you want to use the thermometer for making candy or checking the temperature of oil for frying, a wider range is necessary. Thermometers with a wide temperature range tend to be more reliable, in general. Digital vs analog The choice between a digital or analog readout is mostly a matter of personal preference, although it might be slightly easier to see that the needle on a dial is still moving. Digital thermometers tend to have larger numbers that are easier to read. “I've had a cheap thermometer, and it's really night and day having a quality one,” one of our testers raved about the Taylor Precision Dual Temperature Thermometer. Our reviewers loved this thermometer for its fast and accurate readings, as well as the clear LCD display. 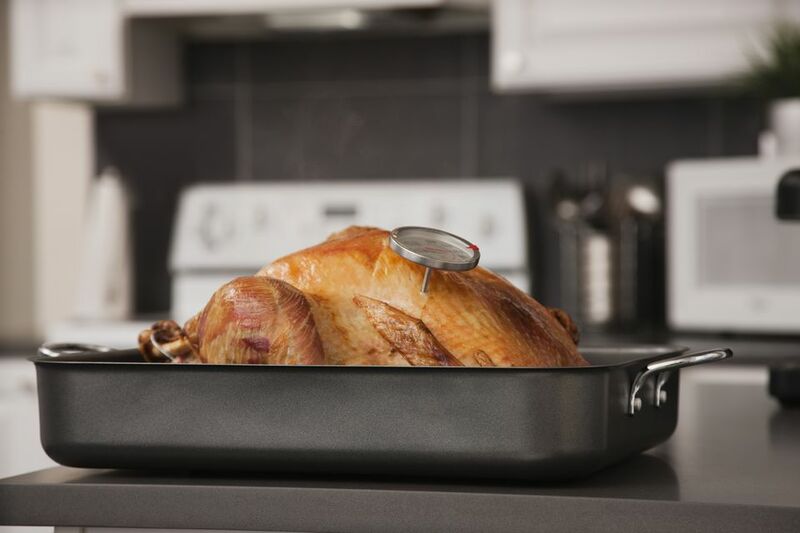 One of our testers found the infrared feature useful for figuring out how his oven distributes heat and checking the temperature of a pan, but the major selling point was the overall precision of the probe that led to well-cooked meat. The only downside mentioned, which wasn’t thought to be a dealbreaker, had to do with aesthetics: “[It] looks more like something that would go in your toolbox than your kitchen cabinet,” one of our reviewers remarked.